To achieve their picture of success. Different coaches use different methods when using the principles of strengths coaching. Some, for example, make full use of the various Strengths Assessment tools. These include Gallup’s StrengthsFinder, CAPP’s Realise 2 and the Strengths Partnership’s Strengthscope. Some coaches employ their own tools for helping a person to build on their strengths. 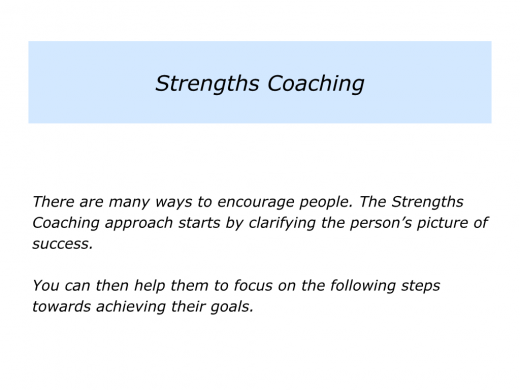 Some coaches combine the strengths approach with elements of other methods, such as Appreciative Inquiry or Dependable Strengths. Some employ principles from Positive Psychology, Humanistic Psychology, Existential Psychology or other approaches. Looking at the vast array of methods, however, it is possible to clarify some core principles that are used in the field. These often resemble the seven steps outlined in the illustration above. This is not to say that there is an actual Seven Step model. 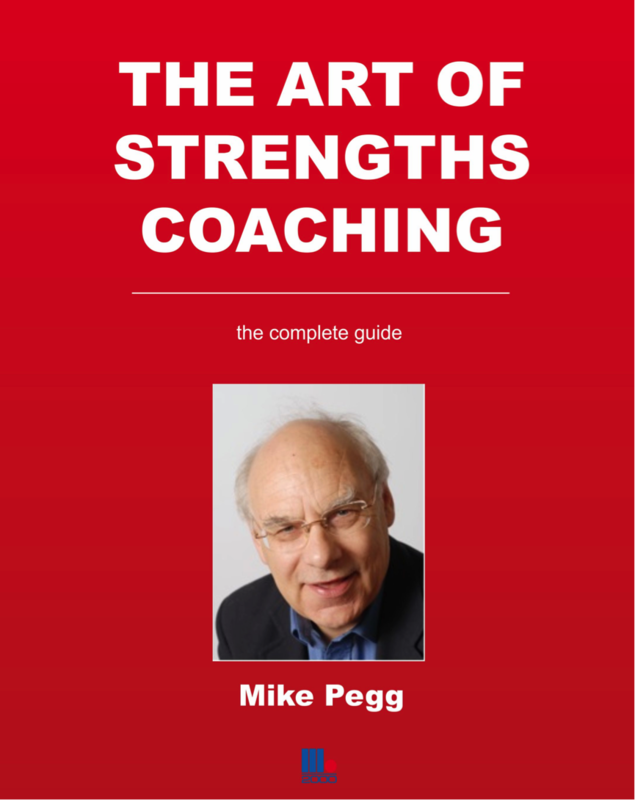 This overview simply provides a map against which you can plot the various approaches to strengths coaching. Good coaches make the person feel welcome. They then make clear contracts about: a) The person’s goals; b) The things they can and cannot offer; c) The aims for the coaching sessions. Let’s imagine both people agree it will be worthwhile to use the strengths approach. The coach may then take some of the following steps to help the person to reach their goals. What topics would you like to explore in the session? Exploring the wider picture for a moment, is it okay to look at your medium and long-term goals? What are your professional goals? What are your personal goals? Everybody has different pictures of success. Imagine you are 80 and looking back on your life. What are the things you would like to have done by then that for you will mean your life has been successful? What is your personal picture of success? Bearing in mind the various topics we have mentioned, which would be the most helpful to tackle? What would you like to take away from the session? Let’s assume the person wants to work towards their long-term goals. Conventional coaches will immediately focus on how to reach these goals. Strengths Coaches, however, tend to spend more time exploring the person’s talents. They see this as crucial in clarifying the resources that the person has to reach their goals. Good coaches check with the person if this approach is okay. If so, they then move on to the first step. There are many ways to find a person’s strengths, successful style and, for example, their specific contribution to a potential employer. 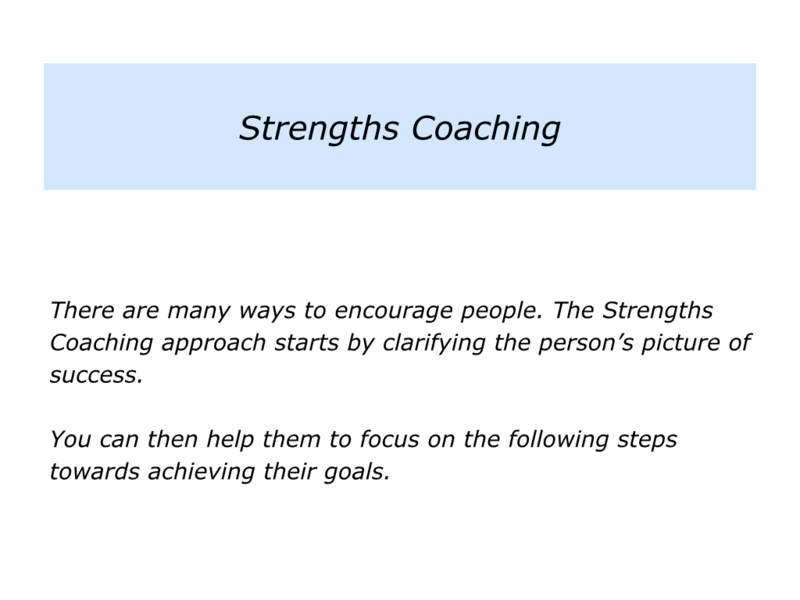 Some coaches use the strengths assessment tools. Others use some of the following questions to uncover a person’s talents. What are you strengths? What are the deeply satisfying activities in which you deliver As, rather than Bs or Cs? When are you in your element – at ease and yet also able to excel? When do you experience a sense of flow? What are the activities in which you see patterns? When do you quickly see the destination – the picture of success? When do you go ‘a, b, then leap to ____ z’? Which are the activities in which you are a good finisher? Let’s explore your successful style. Looking back on your life, what for you have been the three most satisfying ‘projects’? We are using the term project in its widest sense. Looking at each project in turn, what made them satisfying? What were the principles you followed to do good work? How can you follow these principles in the future? Let’s explore your perfect role. What for you would be the most stimulating kind of ‘project’? What kind of people would you like to work with? What would be the most stimulating place – culture and environment? Your strengths are ‘what’ you do best; your style is ‘how’ you work best. Putting these together, what do you believe is the specific contribution you can make – to customers, an employer or other people? If you were a Managing Director, what would you hire yourself to deliver? What legacy do you want to give to the world? What do you want to pass-on to people? Bearing in mind the person’s strengths, the coach returns to the specific issue the person wants to explore in the session. This is normally something related to achieving the person’s long-term picture of success. One key thing is worth bearing in mind at this point. Clarifying the person’s strengths often re-affirms their long-term aims. But sometimes it can lead to revisiting and revising their plans. Let’s imagine, however, that the person has returned to their original aims. It’s now important to set specific goals. Looking at the first theme to explore, what is your specific goal? What are the real results you want to achieve? What is your picture of success? What will be happening that will show you have reached your goal? What are the actual words you want to hear people saying? Try to be as specific as possible. Let’s take a reality check before going any further. Looking at this situation: What are the controllables? What are the things you can control? What can’t you control? How can you build on what you can control and manage what you can’t? Bearing in mind the controllables, let’s go back to your goals. What are the specific results you want to achieve? Clarity is crucial. Good coaches recognise that the more specific the person is about their desired outcomes, the greater their chances of success. They then move onto the next step. Good coaches encourage the person to move onto the ‘How’. So they may ask them some of the following questions. Looking at the specific goals you want to achieve, let’s begin by focusing on what works for you. 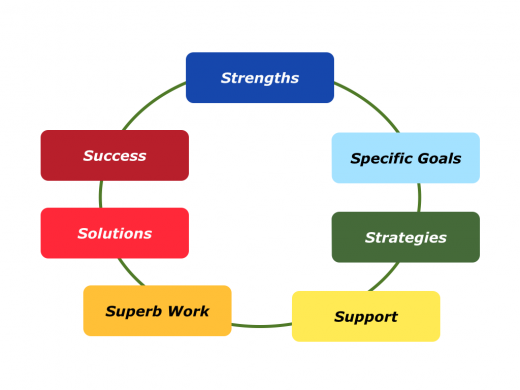 How can you use your strengths – and follow your successful patterns – to achieve your goals? What are the three key things you can do to give yourself the greatest chances of success? Is it okay if I share some ideas? The coach then shares knowledge, models and practical tools the person can use to achieve their picture of success. They share these in a way the person can accept and use in their own way. Good coaches look for the ideas that resonate. They frequently check to see which of these the person wants to explore in greater depth. This part of the session is often like creative problem solving – a topic we will explore later. Sometimes at this point the person wants to move on to making an action plan. They have clarified the ‘What’ and ‘How’. Now they want to move on to the ‘When’. Sometimes this is absolutely appropriate. If so, it can be good to focus on helping the person to make an action plan for achieving success. Sometimes, however, it can be useful to focus on some of the following steps. Even the toughest people need encouragement. Some coaches therefore clarify what support the person may need. They may ask some of the following questions. Looking at the strategies you are going to pursue, what support do you need to make them happen? What is the practical support? What is the psychological support? Who are the people from whom you need support? How can you make clear contracts with these people? What is your back-up plan if you do not get the support? How can you encourage yourself on the journey? How can you manage your energy properly? How can create times for rest and recovery? How can you do some ‘course correction’ and make sure you are still on the road towards achieving your goals? How can you get some early successes? Good coaches ensure the person has built-in enough support. They may then move on to the next stage – how to do superb work. This is more likely, however, if the topic being explored involves the person performing well in their professional role. It’s time to get the show on the road. So the coach may invite the person to explore some of the following questions. How can you do superb work? How can you do your best to deliver success? How can you keep building on your strengths and managing the consequences of your weaknesses? How can you do the right things in the right way every day? How can you be super professional? How can you always do the basics and then add the brilliance? How can you keep in touch with your sponsors – the people who can hire or fire you? How can you satisfy you customers? Good coaches encourage person to embark on their journey. If appropriate, however, they also explore the next stage. Coaches encourage people to anticipate and prevent difficulties. So they may ask the following questions. Looking ahead, what do you see as the potential difficulties? How can you prevent these difficulties happening? What can you do if, despite your efforts, these difficulties do occur? How can you find successful solutions? How can you make sure those difficulties do not happen again in the future? However much the person prepares, sometimes they will still meet setbacks and difficulties. 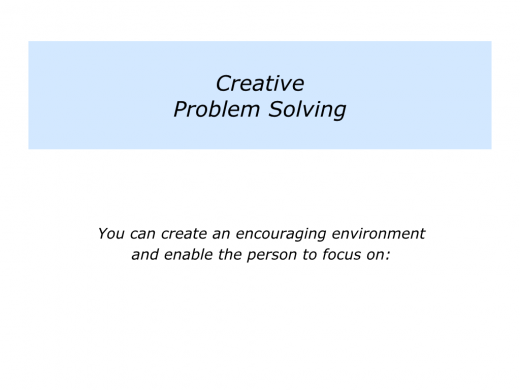 At these times the coach may work with the person to find creative solutions to the challenges. Different people use different models for finding solutions. Coaches sometimes use variations of the 3 C Model. 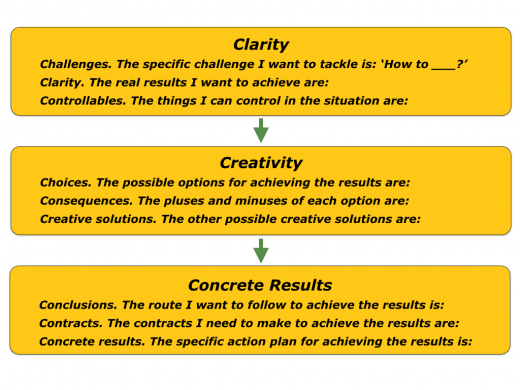 Looking at the challenge to tackle, they encourage the person to focus on Clarity, Creativity and Concrete Results. Here is an overview of the model. 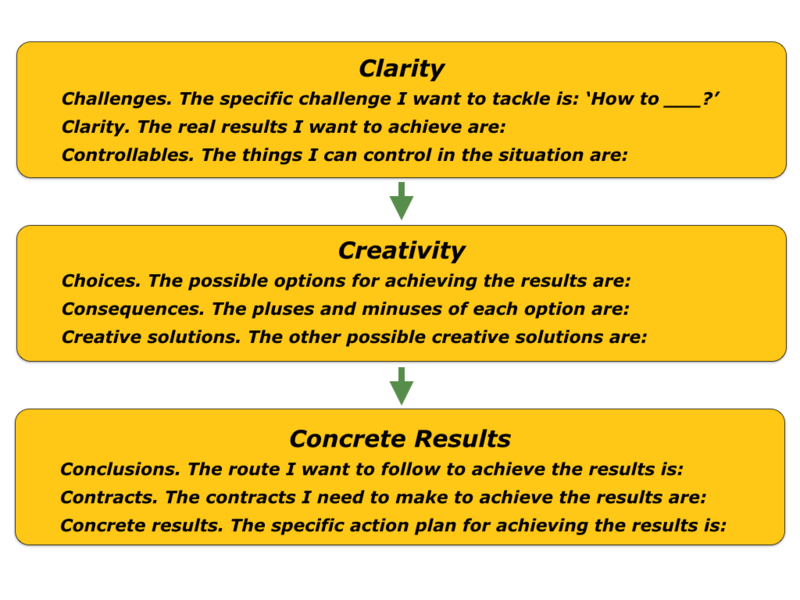 When tackling the challenge, it is vital for the person to clarify the real results they want to achieve. 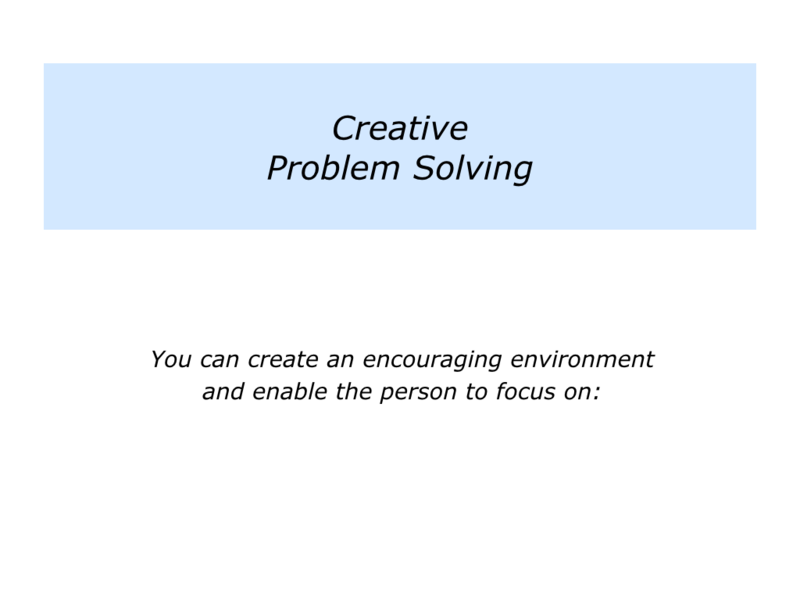 Coaches help the person to find creative solutions to challenges. This is also another time when they may share knowledge, models and tools the person can use to achieve their goals. It is then time to move onto the final step. Good coaches are often like good educators. They encourage, educate and enable people to achieve ongoing success. At the same time, the person must obviously work hard to reach their goals. Let’s assume the person has made an action plan and embarked on the journey towards reaching their goals. The coach may ask them some of the following questions. Let’s look again at your plans for achieving your goals. What have been your early successes? Which milestones have you passed so far on the journey? What are you doing well? How can you do more of those things in the future? What can you do even better in the future – and how? How can keep doing the right things every day? How can you encourage yourself on the journey? How can you manage your energy properly? How can you relax, rehearse and rise to the occasion? How can you do whatever is necessary to reach your goals? How can you achieve peak performance? How can you add that touch of class? As mentioned at the beginning, there are many approaches to strengths coaching. Most borrow from conventional coaching models. To clarify their specific goals. To clarify their solutions to challenges. Whatever approach they use, however, good coaches frequently start by clarifying the person’s goals. They then use their knowledge to encourage, educate and enable the person to achieve ongoing success.